Pilates makes an ideal choice as part of an overall fitness regime since it complements many other types of exercise and sport so well. You might already be doing cardio, weightlifting, a dance class, or playing a sport. By adding Pilates to the mix you’ll find yourself reaping many new benefits. Pilates is suitable for everyone from people who are new to exercise through to all types of sportsmen and women, as well as cyclists, horse-riders, dancers and those who attend the gym. This is because it works the whole body. It builds muscles and improves flexibility and posture, which in turn helps to prevent future injury. Variety really is the spice of life if you like to keep fit and active. With the number of fitness options on offer you no longer need to stick to one type of exercise. This is great news for those find that they become bored or demotivated by sticking to one exercise option. Trying something new, like Pilates, can be a good way of reviving your flagging enthusiasm for exercise. Another bonus is that you may find that Pilates targets new and different parts of your body, yielding new benefits. Reformer Pilates of the kind offered by Pilates Central presents an additional challenge compared to mat-based Pilates. The reformer machine builds your strength and muscles as well as stretching you further via the springs, which provide additional resistance. So, for example, you might find yourself using that resistance to work your arms and legs harder. Using the reformer may also improve your co-ordination. Regular sessions work on strengthening your core, which in turn improves performance when playing sports or doing other types of exercise. The focus on breathing in reformer Pilates means that many people who do it find that they learn for the first time how to breathe properly. This not only helps generally in leading a healthier life but also with sports performance. This is another reason that Pilates is popular with sportsmen and women and athletes. Many people find that their clothes start to fit and hang better on their frame once they have done Pilates for while. This is due to improved posture and the impact of Pilates on the body, which tends to create a long and lean appearance. This is one reason why reformer Pilates is so popular with celebrities. We can offer individually tailored Pilates for golf. If you wonder how Pilates might help you, then perhaps you should know that it is often extremely beneficial for golf players. In fact of all the professional athletes who have discovered Pilates, golfers have taken to it fastest and in greatest numbers. Devotees include: Tiger Woods, Annika Sorenstam, David Duval, Kelli Kuehne, Andrew McGee, Grace Park and Carin Koch, among many others. And maybe this should not surprise us. There are many similarities! They are both about stability. Essentially the ability, in the case of golf, to hold a position long enough to play through a shot without the body buckling or twisting. Both golf and Pilates are about focus and ‘getting in the groove’. That is repeating similar movements efficiently, effectively and precisely. In the case of golf – no matter the distractions: weather, terrain or opponent. Golf, like Pilates, is about: core strength and movement from the centre of the body. Both are about flexibility, precise movements and tiny margins. A small improvement in a golfer’s shoulder flexibility, for example, can be the difference between a drive from the tee veering into the rough or going straight onto the green. Golf is often thought of as a game requiring little more than hand-eye coordination to hit the ball and stamina for a long walk round the course. In reality, it is actually a whole-body sport in which the key movements – particularly when driving or chipping – come from the core. Pilates addresses the need for excellent rotation around the spine while maintaining stability through the transverse abdominal muscles. The shoulders and arms also need to be stable in order to control a shot. Yet they must also be sufficiently strong and elastic to deliver power. After all, we are aiming to send the ball 150 metres and more down the fairway. Top golfers nowadays work on their fitness as much as their putting – a feature that is becoming more common among club-level players, too. As with other sports, a growing number of horse riders are looking for information about Pilates online and wondering whether to add Pilates as part of their fitness regime. We find Pilates complements horse riders well, mainly because the work in the Pilates studio helps their riding technique. Pilates helps to build core strength, suppleness, flexibility, grace and balance, as well as to improve general body awareness. All these elements are extremely beneficial for horse riders are they are key to riding well and developing good posture in the saddle. The perfect riding position is called the ‘classical seat’. This requires the rider to sit in such a way that each part of the body rests on the part directly below it. In doing so, it enables the weight of the rider to reach the horse in a straight line. This minimises discomfort to the horse, while giving security and comfort to the rider. 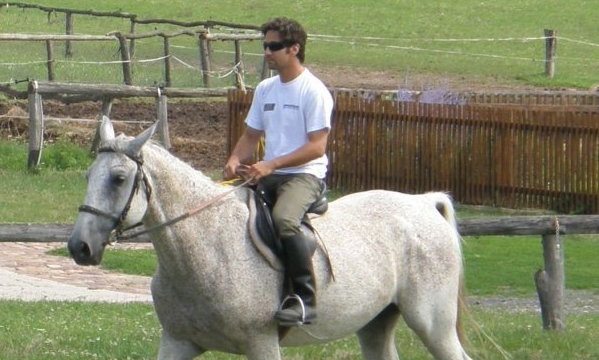 It also helps the rider to guide the horse with ease and efficiency. Done well, human and horse can work as one. What Type of Pilates Programme Is Suitable for Horse Riders? Horse riders do not need a Pilates regime especially for riders. In fact a general Pilates programme will develop the necessary postural alignment and balance required. In addition to this, specific exercises can enhance the ability to move one body part – say, the legs – without the need for major readjustment of the hips and torso, if needed. Here at Pilates Central in North London, we are able to provide just such a programme to all our clients. We individually tailor our classes to accommodate each client’s requirements. So horse riders and other athletes/sportspeople are well catered for and do not need to seek a special class. Since a rider must cope with a horse moving both vertically and horizontally, core strength is vital, as is resilience within the body to maintain the ‘classical seat’. Betsy Steiner, a former member of the United States Dressage Team, is just one riding trainer who recommends Pilates. In fact, she includes a Pilates programme in her book, ‘A Gymnastic Riding System Using Mind, Body And Spirit’, and advises riders of all levels to do Pilates three times a week. Interested in trying Pilates out? Then why not give us a call using the telephone number on our contact page. Alternatively perhaps you may wish to pop into the studio for an informal chat about how we may help you. You can find our address and directions on the location page. We’d love to show you how Pilates can help you develop a better riding position. Pilates provides key benefits for both batsmen and bowlers, which is why many top cricketers use it. This is because the aim of the batsman in cricket is to spend long periods at the crease. This necessitates standing in an unnatural stance that requires forward flexion of the spine. It is hardly surprising that many batsmen have succumbed to back injuries. Pilates can help with this problem by providing specific back pain stretches. Mike Atherton, the former England captain, was one. Atherton swore by Pilates – as a way both to recover from injuries and to prevent future ones. Graham Thorpe, another England batsman, has also used Pilates to overcome serious back problems. The aim of the bowler is: to propel the ball at extreme speed, or to use the angle of the body to create swing, or to employ the shoulders and wrist to impart spin. All bowling actions demand smoothness, economy, rhythm and balance. They also require accurate alignment to enable the body to withstand the force of landing on the front foot and rotating through the spine. Bowling coaches are particularly concerned to eliminate the ‘mixed action’, in which the feet point in one direction (for example, side-on to the wicket) and the upper body in a different one (for example, facing the batsman). Heeding the maxim: ‘Keep the hips and shoulders in line and you’ll be fine; twist the back and it will crack!’, a good Pilates teacher can devise a set of exercises to help a bowler become aware of what this alignment feels like. Practising the exercises before going out to bowl will enhance ‘muscle memory’. The Australian fast-bowling attack, long rated the world’s best, uses Pilates to strengthen the area between the hip and shoulders, as part of injury prevention conditioning. Andrew Flintoff, England fast bowler, took up daily Pilates to solve his back problems, on the advice of Mike Atherton. Flintoff took the advice and was soon back to fitness and form. ‘Aspects of Pilates are used in our training all the time, Nigel Stockill, head physiologist and biomechanist for the England Cricket Board, recently told the press. Pilates, he added, was particularly beneficial to cricketers because it helped them to recover faster from sports injuries and had a strong focus on the abdominal muscles and back. Both amateur and professional cricketers can contact us to find out more about our classes. We look forward to speaking with you! Many swimmers have never thought of doing Pilates as a complementary fitness programme to their swimming. Yet there are many aspects of Pilates for swimming that makes it the perfect exercise. If you swim why not think about how beginners Pilates at Pilates Central might help you? Below we set out why and how it helps. Pilates exercises are performed at a deliberate pace, while employing appropriate breathing patterns and attention to detail. This approach translates well to the pool. Many swimmers need to ‘slow down’ and to forget how many lengths they intended to swim. Instead Pilates teaches Swimmers to focus on breathing, body orientation and balance. This makes swimming a more enjoyable and relaxing experience. It is particularly important to release the neck in order to lengthen the spine. This eliminates the muscular tension that affects the whole body when the head is pulled back. The head position adopted by most poor swimmers would be impossible to hold for long periods out of the water. This is a position particularly found when performing the breast-stroke. The challenge, therefore, is to ‘remember to remember’ the superior postural alignment and sense of lightness gained through Pilates and apply it in the pool. Swimming, meanwhile, has the image of being a sport for which the prime requirements are strength and determination. Success is measured in terms of ‘how far’ and ‘how fast’. The skill of learning to swim well is overlooked, with little attention paid to grace, elegance and economy of movement. As a result, it is rare to find recreational or fitness swimmers demonstrating effortless, efficient strokes that cause barely a ripple on the surface. Instead, too many of them view swimming as a battle against a relentless opponent – the water. Hence the number of head-out-of-the-water thrashers, expending energy but getting nowhere, both literally and metaphorically. Due to the above, for many swimmers swimming is actually not that relaxing. Pilates teaches its students to focus on the core, the breath, and to be in the moment acutely aware of their posture and movement of their bodies. Many Pilates students find this to be transformative. When applied to swimming, it results in an improved technique, which funnily enough often results in faster swimming. Not only that, but Pilates positively impacts overall fitness, which in turn helps with stamina and the ability to swim more lengths of the pool. Swimmers who also do Pilates find it easier to focus on breathing, grace, flow and maintaining a steady pace. So if you are a swimmer and would like to find out about attending beginners Pilates classes at Pilates Central, why not give us a call via the details on our contact page?